This is a refreshing summertime treat. 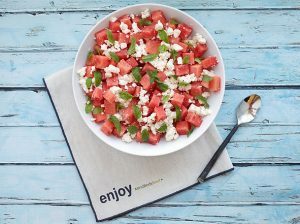 The cool, crisp, sweetness of the watermelon pairs beautifully with fresh mint and tangy feta cheese. Despite the popular belief that watermelon is just water and sugar, watermelon is actually a nutrient dense food. It provides high levels of vitamins, minerals, and antioxidants and just a small number of calories. It’s an excellent source of antioxidants, including vitamin C, that can help combat the free radicals known to cause cancer. Mint adds extra refreshing flavor to this recipe, and contains a variety of enzymes, calcium, phosphorous, vitamin C, D, E and small amounts of vitamin B. All these compounds put together support the body’s immune system and help cool the fires of inflammation. Fight cancer in your kitchen (or on the patio) with this refreshing watermelon salad! 1. Cut the watermelon into 1/2 inch cubes. 2. Combine with feta cheese, black olives (optional) and chopped mint in a salad bowl. 3. Pour the lime juice and olive oil over the mixture and toss gently to coat. Add salt to taste.